Some years ago the Hotel was closed down in preparation for an ambitious and extensive renovation programme. Re-opened in early summer 2011, what was unveiled was a contemporary, stylish boutique Hotel with 26 stunning guest rooms, new restaurant and function facilities that will place it as one of Ayrshire�s largest and most stunning wedding and events venues. 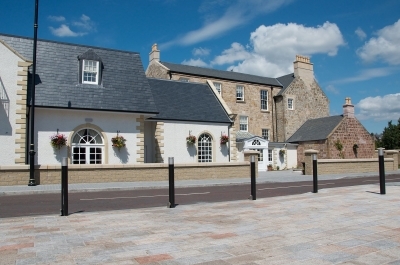 Rich in history, The Dumfries Arms Hotel has stood at the heart of the ancient burgh of Cumnock since the early 18th century and even predates nearby Dumfries House, saved for the nation by HRH The Prince of Wales and now one of the nation�s most stunning heritage attractions. Over its 300 year history the hotel�s guests have included some colourful and well known characters including our national bard, Robert Burns and Sir Walter Scott, who made reference to his stay in Old Cumnock� �where beds are as hard as a plank, sir�. Much has changed since then! However, being an important part of our heritage, due homage has been accorded with these historic words being embroidered on soft furnishings within our guest rooms. We should add that our beds are magnificently comfortable! We look forward to welcoming you to one of Scotland�s newest, privately owned boutique hotels whether as a resident, diner, or to view or stunning function facilities if you are planning a very special event. A warm welcome is guaranteed. If you are looking for a wedding venue that oozes contemporary style and sophistication and yet, at the same time, remains intimate and personal, then look no further. In planning our refurbishment, your wedding day was at the forefront of our mind. The Dumfries Arms Hotel is Ayrshire�s newest wedding venue. Whether you are planning an intimate wedding for 50 guests or a grand scale celebration for up to 250 guests, we have the facilities, the style, the accommodation and the expertise to make your wedding day THE wedding to remember. In-built to the design concept was the ability to have flexible accommodation that can be configured to match your wedding plans and number of guests. Your wedding ceremony, celebration dinner and evening reception can all be accommodated in a way that will exceed your aspirations about how this important and special day will be planned out. When it comes to making a wedding day special, meticulous planning is paramount. We don�t plan your wedding � we work in close partnership with you. Our Wedding Coordinator will guide you through each part of the day and is here to advise you and guide you. Ultimately, you make the final decisions. We offer very special room rates for you and your guests when a wedding booking is made. If you would like to discuss your wedding plans and have a look around our facilities, simply CALL 01290 429230 to arrange a meeting time with our Wedding Coordinator.